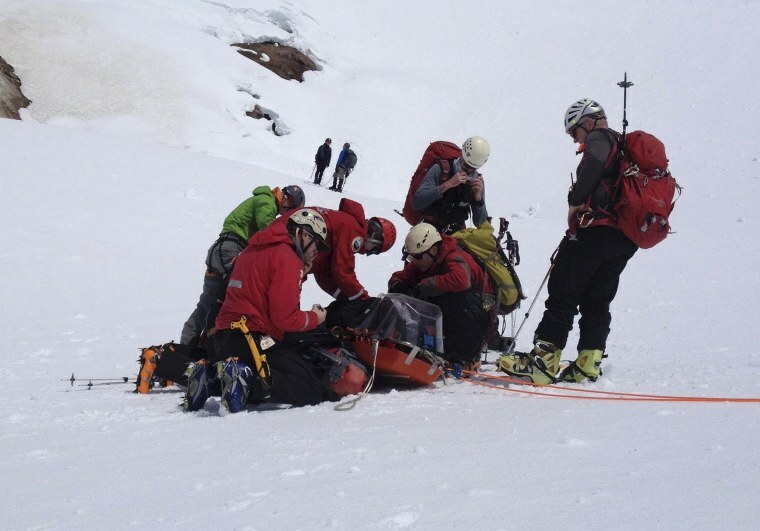 Members of the Portland Mountain Rescue team tend to rescued hiker James Michael Adams, after Adams fell more than 800 feet from near the top of Mt. Hood and then plummeted into a gaping hole emitting toxic gases on May 24. PORTLAND, Ore. — A climber who slipped from near the top of Oregon's Mt. Hood, sliding 800 feet before plunging into a gaping hole that emits toxic volcanic gases, managed to survive the plunge and was in fair condition on Tuesday, officials said. After sliding down the active volcano's slope, 59-year-old James Michael Adams landed at the bottom of a fumarole, where hot lava rocks emit toxic gases such as sulfur dioxide, Portland Mountain Rescue spokesman Mark Morford said. Though badly injured with multiple fractures and internal injuries, Adams was conscious and able to call out to nearby climbers at the surface, said Scott Norton, one of the rescue leaders. Since he was able to speak, rescue workers determined it was safe enough to enter the hole to haul him out. "I'd say this guy, he was very, very lucky," Norton said, adding that the rescue crew, already on the mountain, was able to get to Adams in less than two hours. "We had to borrow ropes and pickets and all kinds of equipment from other people nearby." A helicopter was able to land nearby because of the way the snow melted this year and Adams, of Tualatin, in Oregon, was taken to Legacy Emanuel Medical Center. Mt. Hood, about 60 miles east of Portland, is a popular climbing spot, with 8,000 to 10,000 climbs per year. New Jersey Catholic Priest Robert Cormier, 57, died this month in a fall from the top of the mountain. Norton said the rescue team was working on ways to teach climbers how to safely maneuver the fumarole. "Our concern is that the feature is going to be more of a hazard this year," he said.